WindRock - Inflation: Why, When, and How Much? Inflation: Why, When, and How Much?
. . . there is no record in the economic history of the whole world, anywhere or at any time, of a serious and prolonged inflation which has not been accompanied and made possible, if not directly caused, by a large increase in the quantity of money. The phrase "not worth a continental" may be vaguely familiar to Americans as an old and quirky saying, but to Revolutionary War-era Americans it would have been a harsh reminder of a recent nightmare. In order to finance the war, the Continental Congress authorized the issuance of money without rights of redemption in specie (unlike other currencies in circulation). In short order, over $225 million Continentals were issued on top of an existing money supply of only $25 million. Initially traded on a one-for-one ratio with paper dollars backed by coin or precious metals, within a mere five years Continental currency had depreciated to worthlessness. It was America's first experiment with a fiat currency, and it cost many newly free Americans their livelihoods and savings. Such expansion of the money supply is not relegated to America's past. In response to the 2008 economic crisis, by some measurements the Federal Reserve has more than quadrupled the money supply. With such pronounced expansion, will the U.S. soon experience significant inflation, and if so, how severe may it be? Answering these questions requires an understanding as to the causes of inflation. While the experience of America's Continental currency would appear to squarely pin the blame for inflation on increases in the money supply, not all economic schools of thought agree. The causes and remedies of inflation vary significantly between the Keynesian and Austrian Schools of Economics. Keynesian economic theory believes inflation materializes when aggregate demand for goods and services exceeds aggregate supply when the economy is at full employment and capacity. How can aggregate demand increase beyond that of supply? Keynesians offer a number of possible explanations, including greater consumer confidence, increased disposable income through tax cuts, and additional funds available through lowered interest rates. Since the economy is at full employment and capacity, increased aggregate demand forces producers of goods and services (soon to be followed by their suppliers) to increase prices. Here lies the origin of the belief in inflation from an "overheated" economy. It should be emphasized that, under this theory, inflation cannot exist during periods of economic weakness and recessions. So confident were Keynesians of the impossibility of inflation during a recession (known as "stagflation") that noted Keynesian economist Arthur Burns commented that "we all have to resign" if such a situation developed. When this situation did indeed develop during the 1970's, Mr. Burns unfortunately did not tender his resignation as Chairman of the Federal Reserve. In fact the economic situation of the 1970's should have thoroughly discredited Keynesian economics. However, a concept from 1957 was put forth to explain this calamity. Termed "cost-push" inflation (to differentiate it from the "demand-pull" theory previously discussed), it was proposed that price increases in certain commodities force the prices of all goods and services higher. For example, as oil permeates the economy and lacks immediate substitutes, increases in the oil price will raise prices for fuel, plastics, and other oil-derived products. But the "cost" paid by the buyer of a good is simply a "price" received by the seller. Costs are prices: they are simply the price of something which is an "input" into another good or service. So arguing that prices go up because some input prices (costs) increase never explains the central question of why those input prices (costs) rose. It simply pushes the argument down the supply chain. So what does cause inflation? Clues can be culled not just from historical precedent such as America's Continental currency, but from one of the most obvious relationships in macroeconomic data: that of prices and money. Austrian economic theory proposes that money, like any other good, has a price set by supply and demand. The word "price" in terms of money, to avoid confusion, can be thought of as "value". If the demand for money increases, its value increases and the prices of all goods and services fall. If the supply of money increases, its value decreases and the prices of all goods and services rise. Today this latter effect is known as inflation. The demand for money (the desire of individuals and entities to hold cash balances), however, except under extreme economic situations, is not prone to change substantially relative to the changes in supply. Therefore, the supply of money is of primary importance in determining its value and hence the overall price level. In the United States, money is created by both the Federal Reserve and the fractional reserve banking system. Purchasing Assets: For purposes of the effect upon the overall price level, it does not matter which assets are purchased as long as they are bought with newly created money. This action is performed by the Federal Reserve's "open market operations" which historically has consisted of buying and selling Treasury securities (and now includes a large dose of mortgage-backed securities). Purchasing assets allows the Federal Reserve to instantly increase the supply of money and manipulate both interest rates and the prices of securities through its selection of assets to purchase. After successive rounds of “quantitative easing”, the Federal Reserve announced a self-described “highly accommodative stance of monetary policy” on September 13, 2012 in which it committed to monthly asset purchases of $85 billion. This open-ended policy will resulted in annual purchases of over $1 trillion (especially significant relative to the 2012 U.S. Gross Domestic Product of less than $16 trillion). Despite reducing, or “tapering” its purchases in 2014, current monthly asset purchases are still significant at $45 billion as of the date of this article. Lending Money to Banks: The discount rate is the interest rate by which commercial banks may borrow additional reserves from the Federal Reserve. It is a rate set by the Federal Reserve. With lower rates, banks are more inclined to borrow money, thus expanding the money supply. Currently, the rate is set at the near-historically low level of 0.75%. To emphasize how significantly low this rate is, it was set above 6% as recently as 2006. Lowering Banking Reserve Requirements: While not commonly understood, it can have the most immediate and profound effect upon the money supply and the economy relative to the other monetary creation tools possessed by the Federal Reserve. Commercial banks, by lending out demand deposits, create additional dollars in the system above-and-beyond that of the Federal Reserve's actions. The word "fractional" in fractional reserve means they hold but a fraction of what can be demanded from them at any given time. Currently, banks only need to have 10% of their demand deposits available for withdrawal by depositors. This means that with a reserve requirement of 10%, banks can increase the money supply equal to 10 times their demand deposits. BASE. Currency in circulation and deposits held by domestic depository institutions at Federal Reserve Banks. M2. Currency in circulation, savings deposits, and retail money market mutual fund shares. MZM. M2 with the addition of institutional money funds. Three trends are readily apparent from this graph. First, regardless as to the definition of money, the money supply has expanded dramatically over time as the increases are measured in thousands of percentage points. Second, the overall expansion appears to have begun in earnest in 1971 which is, not coincidentally, when President Nixon severed the last links of the U.S. dollar (and effectively all other major currencies), from gold. Third, the money supply as measured by BASE has exploded since 2008 (up 348% from August 2008 to March 2014) while the money supply from the other two measurements has not followed the same degree of increase (although they too have experienced accelerated growth). Why has M2 and MZM not followed BASE? Note that the definition of BASE includes "deposits held by domestic depository institutions at Federal Reserve Banks" which is not part of the M2 and MZM classifications. Traditionally, to maximize profits, commercial banks hold their "excess reserves" at close to zero. That is, they tend to quickly lend out any reserves they have over-and-above their legally required minimum. 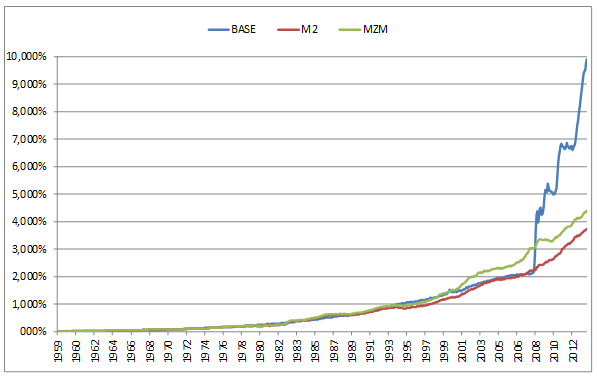 So the difference in BASE relative to M2 and MZM reflects the current lack of new lending by commercial banks. Why have the commercial banks not followed their historical behavior and lent out their excess reserves? The recent level of interest rates is the likely cause. As of October 3, 2008, the Federal Reserve was legally allowed to pay interest on these excess reserves. This rate has been modest, and currently sits at only 0.25%. In an environment of extremely low interest rates, commercial banks view this risk-free rate of return as desirable, and apparently prefer this rate relative to rates commanded through lending. However, as the level of interest rates continues to increase, holding excess reserves will become less attractive. So the discrepancy between increases in M2 and MZM relative to BASE may be ending, and the money supply as measured by these indicators may follow the BASE trajectory. The data supports the contention that increases in the supply of money create increases in the price level. Why does the relationship not correspond exactly? There are four primary reasons. First, as the economy experiences real growth, the demand for money increases due to both the larger number of entites holding cash balances (i.e., more firms are created as the economy grows) as well as the general trend for economic actors to increase cash holdings with greater economic opportunities (i.e., goods and services). As previously stated, increased demand for money raises its value which decreases the prices of all goods and services. Alternatively, a shrinking economy will decrease the demand for money (all things being equal) which will exacerbate the inflationary effects of money creation. Second, there are timing issues between the increase in the supply of money and the appearance of inflation. The time delay is not consistent throughout history, and is influenced by a number of factors. Third, the U.S. economy is not a closed system. To the extent dollars circulate outside of the U.S., whether as "petrodollars" or as the de facto national currency of a foreign country, the diversion of such dollars from the U.S. economy effectively reduces the money supply as measured by official statistics. Fourth, there are deflationary forces which counteract increases in the money supply. As previously discussed, the U.S. operates a fractional reserve banking system. By lending out monies received from demand deposits, commercial banks increase the money supply. However, the reverse is also true. As these loans are repaid (unless lent out again) or defaulted upon, the money supply is reduced. Together, these effects may delay or, to a limited degree, mitigate future price level increases. But due to the magnitude of increases in the money supply, these four effects cannot offset future price inflation. So while timing of the onset of significant price inflation may be uncertain, its eventual arrival is not, for the the correlation of increases in price levels with increases in the money supply is indisputable. From August 2008 through March 2014, the money supply has grown significantly as measured by MZM (43%) or M2 (67%) (and, as previously noted, it is likely they will follow the even greater growth experienced by BASE). It does not matter if the Federal Reserve continues to "taper" or even ends its "highly accommodative stance of monetary policy" - these inflationary forces are already within the economic system. In addition to explanations as to the cause of inflation, Austrian economic theory provides unique guidance as to its repercussions and cures. Non-Austrian economists may view inflation as neutral to the economy. That is, consumers still buy and businesses still produce - albeit at higher price levels. However, prices do not all rise in tandem and by the same amount. Money creation not only increases the overall price level, but also distorts prices of goods and services relative to each other. Perhaps more importantly than which prices are rising (and by how much) is the question of who spends the money first? Austrians understand the wealth transfer effects of inflation. Those who initially spend newly created dollars are able to acquire goods and services prior to the rise in prices. Those receiving the newly created money later on will be suddenly faced with higher prices. So purchasing power, or wealth, has increased for those first receiving (or creating) the newly printed money. In short, the U.S. government, commercial banks, and associated entities profit from price inflation at the expense of others. It is a powerful incentive for continued monetary expansion. Austrians also recognize that the primary cause of inflation, increases in the money supply, also has another impact on the economy. As money is created, it lowers the level and distorts the structure of interest rates which then causes recessions. Brevity precludes a discussion here of Austrian business cycle theory, but a short explanation can be found here. So what is the cure for inflation? For past monetary increases which have not worked their way into the general price level (as in the current situation for the U.S.), there is no cure. But to banish additional future inflation, the obvious answer is the curtailment of increases in the supply of money. But how can such increases be prevented from recurring? Austrian economic theory proposes a solution grounded in historical example: governments should have nothing to do with the supply of money. Note that Austrians do not technically favor a "gold standard". Austrians favor the free market to determine what should constitute money, and time and time again throughout history, gold (and to a lesser extent silver) has been chosen. This is what "monetary management" really means. In practice it is merely a high-sounding euphemism for continuous currency debasement . . . Instead of automatic currencies based on gold, people are forced to take managed currencies based on guile. Instead of precious metals they hold paper promises whose value falls with every bureaucratic whim. And they are suavely assured that only hopelessly antiquated minds dream of returning to truth and honesty and solvency and gold. Substitute "money management" for "quantitative easing" or "open-market operations", and the quotation is an equally fitting commentary on today's situation. In the U.S., the last several years have witnessed an unprecedented expansion of the money supply. Even America's failed experiment with Continental currency, while incorporating a larger expansion of the money supply, is not truly comparable. 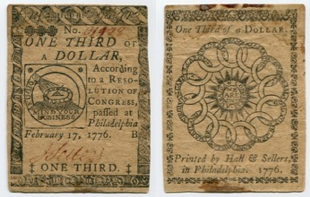 For in Revolutionary War-era America, alternative currencies were readily accessible and used in the daily course of business, thus providing a measure of ability to disengage from the failing Continental money. But no such options exist for today's Americans who must transact their daily business in U.S. dollars. So while the Continental dollar was disastrous, the future situation for today's dollar may prove far worse. Lenin is said to have declared that the best way to destroy the capitalist system was to debauch the currency. Lenin was certainly right. The process engages all the hidden forces of economic law on the side of destruction, and does it in a manner which not one man in a million is able to diagnose. Or, apparently, not one Keynesian in a million, for inflation indeed has a definitive cause. While inflation will not destroy capitalism in America, it will indeed be devastating and disruptive. But investors are not helpless. With proper planning, they can preserve the purchasing power of their wealth and also profit significantly. All written content in this article is for information purposes only. Opinions expressed herein are solely those of WindRock Wealth Management LLC and our editorial staff. Material presented is believed to be from reliable sources; however, we make no representations as to its accuracy or completeness. All information and ideas should be discussed in detail with your individual adviser prior to implementation. For reasons which cannot be expounded upon due to spacing constraints, the Austrian economic school of thought rejects the concept of aggregate demand and supply, let alone its use as a justification for inflation. Additionally, common sense suggests that cost-push effects on the overall price level are a fallacy. The oil price increases in the 1970's was dramatic, but the price of oil has experienced equally pronounced changes in prices over the last decade as well. Has the overall price level changed accordingly? Has the U.S. economy experienced significant inflation and deflation as oil moved from $25 (April 2003) up to $133 (July 2008) down to $40 (December 2008) and then back up to $125 (March 2012)? This same argument, that higher prices for some goods lower the demand for others, and thus the prices of those other goods, is equally effective in demolishing demand-pull inflation theory. Assuming "overall demand" somehow increases, the money must be spent on something, which means the items which were forsaken will fall in price. Ludwig von Mises, and most other Austrian economists, refer to the classic definition of inflation as "the increase in the quantity of money and money substitutes" and not "the general rise in commodity prices and wage rates which is the inevitable consequence of inflation." (Planning for Freedom, 1952). By utilizing this classic definition, Austrian economists attempt to emphasize the unique role of money in creating inflation. Due to the current wide acceptance of the definition of inflation to be "the general rise in commodity prices and wage rates," this article uses the term "inflation" synonymously with its current usage. Technically, the reserve requirement is tiered, but overall the effective reserve requirement approximates 10%. The M2 money supply data presented herein is actually the category "M2 less small time deposits". Data has been presented since 1959 which is the first year data is available for M2 less small deposits and MZM. BASE data is available from 1918. For additional information on the history of money and President Nixon's actions, please view the video Gold, Government, and a Game Plan as posted at www.windrockwealth.com. 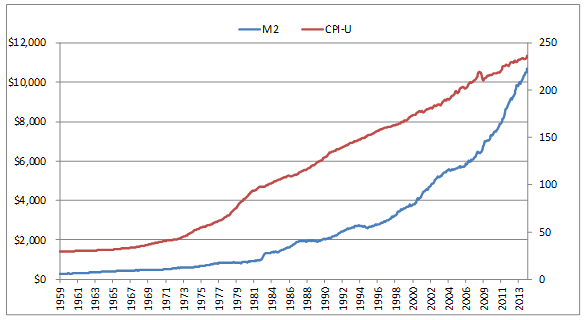 M2 is measured in billions of dollars on the left vertical axis while CPI-U is measured as an index on the right vertical axis. As an aside, some may argue that, in addition to the supply of money, inflation can be caused by increases in the velocity (speed of circulation) of money. The reasoning, however, is reversed: the velocity of money is not a cause of inflation but rather a result of people spending quicker in the anticipation of the currency continuing to fall in value. Given recent actions in Argentina (and U.S. policy in 1971), the merits of wage and price control "remedies" should be addressed. In short, they cannot mitigate inflation. For every dollar not spent on products with price controls (and because of the natural shortages generated by price controls, there will be limited amounts spent on such items) increases the demand for goods and service not covered by the controls. Curiously, despite largely agreeing with the Austrian school on the cause of inflation, the Chicago School of Economics (also known as Monetarists), favor a central banking policy whereby it would engage in a steady increase of the money supply at a minimal (but arbitrarily selected) annual percentage rate. Their solution to a gross failing of government action is more disciplined government. Hazlitt, Henry. What You Should Know About Inflation (Princeton, New Jersey: D. Van Nostrand Company, Inc., 1960), p. 24. Keynes, John Maynard. The Economic Consequences of the Peace (New York: Harcourt, Brace, and Howe, Inc., 1919), pp. 235-248.